Integrated Environmental Restoration Services (IERS) is developing a comprehensive restoration-based watershed plan for Homewood Mountain Resort, which is located in one of the most erosive watersheds in the Lake Tahoe Basin. Framed by adaptive management, this watershed plan is an assessment and action plan for near-term efforts designed to achieve measurable water quality improvements. This plan builds on two years of watershed assessment, GIS mapping, cutting-edge road removal and upland restoration treatments, and research-level monitoring research already completed by IERS at Homewood. The plan provides an integrating framework for redevelopment planning, mountain operations, ongoing management and restoration strategies. 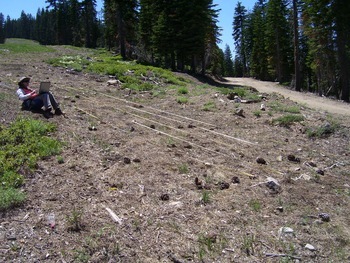 This project has helped leverage grant funding from the State Water Resources Control Board to conduct an implementation pilot project for the Lake Tahoe Total Maximum Daily Load (TMDL) that includes scaling up the implementation and measurement of restoration efforts in the Homewood Creek watershed. Erosion monitoring at Rainbow Ridge road before treatment. 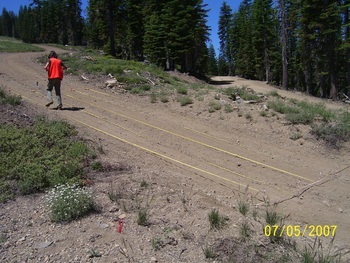 Erosion monitoring at Rainbow Ridge road, one year following treatment.